The exhibition title directly references Lewis Carroll’s sequel to ‘Alice’s Adventures in Wonderland’ in which the protagonist returns to a fantastical world through a mirror. Her journey is defined by her constant transformations in size and her experiences where everything exists in reverse, including logic. Taking this as its germ, the multidisciplinary works included in Through the Looking Glass activates the viewer’s sensory perceptions of scale across two and three dimensions, compounding a complex human psychological fascination with both the possibility, and seeming impossibility of the miniature pitted against the scale of our bodies. The origins of the miniature artwork remains in early medieval manuscripts which then evolved into the functional portability of portrait miniatures of the 16th century European courts. The skill of a miniature portraitist often determined the reputation and social status of the client, and the commissioning of these portraits remained popular until the emergence of photography. Often defined as being able to ‘hold in the palm of your hand’, the creation and exchange of miniature art historically has always been symbolic of the intimate gesture; a love token or memento; or something that must be contemplated and treasured. Through the Looking Glass harnesses the intimacy associated with this historical genre contrasted to the tendencies of the contemporary art world- which is more often than not in favour large and imposing works that vie for attention through their grand gestures or physical nature. Substance and skill may sometimes be overlooked in these works and the sheer scale of the artwork can overwhelm the public, all semblance of critical thought being dwarfed by relational inferiority. Here, the intricacies of craft and technicality are highlighted, with smaller works imbued with signs of the artist’s patience and diligence giving a more intimate and precious sense to the pieces. Through The Looking Glass encourages people to slow down, take a closer look and really contemplate what they are looking at. Through the Looking Glass- looks at an expanded concept of the miniature art genre- exploring considerable behavioural nuances behind our love for the minuscule through a simultaneity of the compulsion of the artist to create works on a small scale and the impulse to marvel at encountering it. 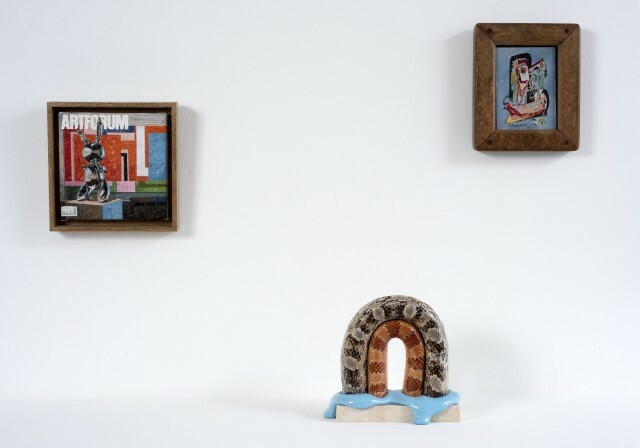 Artists and works have have been selected for their varying approaches to the miniature- be it specifically commissioned to create miniature versions of their works; displaying works at odds with their more well known practice at a large scale or creating painstaking replicas of micro objects from a variety of unusual artistic materials. Perception and scale is challenged both physically and conceptually through the works of Kenji Sugayama, Kitty Finer and Jason Shulman. Sugayama has created a miniature museum encountered by the viewer by peering into the retina of sculpted eyeball, Finer has constructed a miniature exhibition within the confines of a vitrine, and lastly Jason Shulman creates a work which suggests that by laws of perspective, our entire three dimensional perception of the world is actually miniature. More overt satirical subversions of the traditional miniature, include works from Grayson Perry and artist duo Akiko & Masaka Takeda. Subverting the tradition of miniature artworks created as precious memento or as a conduit for contemplation- Susan Collis’ extraordinary interpretations of everyday objects- easily discarded or overlooked in both their size or their ‘everyday’ value- are created using precious materials as an investigation of craft, value and labour. Young contemporary artists on exhibit include Hirosuke Yabe, Realf Heygate, Tristan Pigott, Charlotte Colbert, Antony Cairns and artist duo Walter & Zoniel blended with established artistic talent including Polly Morgan, Jake and Dinos Chapman, Gavin Turk and Mat Collishaw. These are interwoven with alongside exemplary modern artists works from Pablo Picasso and Lynn Chadwick. Meanwhile, a room in the exhibit is dedicated to Alexander Calder’s ‘Le Cirque Calder’, a film beautifully shot by Vilardebo of the artist performing a miniature Circus. Miniature artworks invite respect for their technical prowess and the daintiness of their construction, but that’s only a small aspect of their timeless appeal. Part of the fantasy of the miniature is that they offer an alternative universe, and in psychological terms, to create or interact with the miniature object is to play out a human desire for ‘total control’. This universality, is emphasised in this context, where 44 artists from a multitude of backgrounds, disciplines and periods can be viewed under a common theme.